Half way between Kenmore and Hynes (inbound), there is always a red light. It's been there for at least 55 years. The train comes to a stop and sits for 6-8 seconds. The light turns green and it's a clear shot to Hynes station. So I did my own timing study. Watching survey markers on the tunnel walls, I find that this signal typically adds 18 seconds to an inbound trip on the Green Line. If we assume 30,000 Green Line riders a day, that totals 150 man-hours per day wasted on this light. Even at a minimum wage of $8 per hour, that's $6000 per week. So what's the point? If it's some sort of device to regulate speed, it's overkill. After all, once the train has come to a complete halt, it can't slow down any further, so why not turn the signal green right away. If the goal is (for example) to make sure that the train is going less than 12 MPH, surely something more sophisticated could be built in the 21st century. Why does this exist at all? Was there some de-railment here and the MBTA, rather than correct the track, decided it was easier to consume the patron's time? Sixty years ago, this was the only one. Now there's another as the B trains enter the subway. Talk about wasted inertia. The red light is at the bottom of a hill before the climb to Kenmore station. And there's another half way between Beacon Junction and Kenmore, inbound. And another outbound between Hynes and Kenmore. And another outbound between Boylston and Arlington. So what's changed in 60 years to require all these new timing signals. And for those of you who say, "Stop your complaining. It's only 18 seconds per light", I invite you to try this experiment: On your way to work tomorrow, when the light turns green, don't move for 18 seconds. See if those people behind you mind waiting for "only" 18 seconds. And don't just do it once, do it twice on the way to work and twice on the way home, just like the Green line riders. They don't call it "Rapid Transit" any more. If the MBTA wants to gain ridership, they've got to pay attention to speed. To me, it seems that the MBTA takes after a quote from The Taking of Pelham 1-2-3, "Screw the goddamn [subway] passengers! What the hell did they expect for their lousy 35 cents ..."
They are essentially safety STOP signs. It's to prevent a train from entering certain locations at high speed. Someday when a new signal system is installed, these will be replaced. BUT no matter what system is installed the new signal system will make the system slower. So be careful what you wish for! Yellowspoon wrote: Why does this exist at all? Was there some de-railment here and the MBTA, rather than correct the track, decided it was easier to consume the patron's time? Presumably these things were installed because the MBTA no longer trusts its motorpeople to observe posted speed limits in the tunnel, so the system gets dumbed down. But you're absolutely correct that the Green Line now is a lot slower than it was in PCC days. Of the speed lights you mentioned, I remember 3 were around when PCCs and LRVs ran together, the Kenmore/Auditorium inbound, Beacon Junction/Kenmore inbound and the Boylston/Arlington outbound. During that time, the lights did not hold a train for as long a period, many drivers could time it perfectly by coasting up to the signal and letting it change. The other speed lights were added much later and as you stated, nowadays it is not possible to coast thru any of the lights unless the train is crawling up to the signal. Sounds to me like this person needs to get a life! 6-8 seconds for a stop and proceed adds no time at all to a commute, the writer wasted more time writing up this article, presumably on company time then it took for the train to stop and move on! BandM4266 wrote: Sounds to me like this person needs to get a life! 6-8 seconds for a stop and proceed adds no time at all to a commute, the writer wasted more time writing up this article, presumably on company time then it took for the train to stop and move on! C: There is a real issue here, as discussed in the thread. Lesson: If you don't think a subject is worth discussing . . . don't discuss it. Doesn't mean other people can't talk about it while you're off being productive or something. Doesn't the outbound always-red near ex-Public Gardens incline also act as a brake check for the obstructed-view down grade into Arlington? The Blue Line's East Boston Tunnel under the harbor uses timing signals that control a train's speed without stopping it. If a train is going too fast, it will have to stop at the signal, but at the proper speed the signal will clear shortly before the motorperson would have to start braking for it. If the intent of the Green Line signals are simply speed control, I wonder why a full stop is necessary. Signals timed to control speed are common all over the New York City Subway and PATH, and as TrainManTy commented it is perfectly possible to arrange them so that a train proceeding under control at the prescribed speed will see the signal clear up as it approaches, so that no stop is necessary. Apart from the other considerations mentioned, standing passengers, of whom there are many on the Green Line at all hours, find incessant stops and starts to be very irritating. There's also a required stop when entering the portal from Science Park to North Station. However, this is due entirely to the sudden change in lighting, so they need to ensure a slow entry and give operator's time for their eyes to adjust and for them to mentally register any signals that come into view once in the dark tunnel. I feel this could be easily addressed, however. As mentioned earlier: what a waste of inertia to stop on a decline. Why not use bright lights inside the tunnel but at the entrance, as with highway tunnels? This allows for a gradual change in lighting to be able to see into the tunnel ahead of you. Or/also, they could do something prior to the portal with beams/canopies to put the incline in the shade to help with adjusting vision and better enabling operators to see into the tunnel. If you adhere to the posted speeds those time lights will almost always turn yellow right as you reach 'em. Otherwise you stop for 2-3 seconds. Not service hindering and keeps people in check. And thanks to our moderator for pointing out that even though automation would eliminate time lights it would indeed slow service down. Exactly. They are all safety stop signs in the form of a signal. The full stop is to make sure the operator knows how the train is going to handle coming down grades into stations where there can be other stopped trains. They are not speed control signals like the Blue Line. That makes a lot more sense. Thanks for clarifying, John. TrainManTy wrote: The Blue Line's East Boston Tunnel under the harbor uses timing signals that control a train's speed without stopping it. If a train is going too fast, it will have to stop at the signal, but at the proper speed the signal will clear shortly before the motorperson would have to start braking for it. If the intent of the Green Line signals are simply speed control, I wonder why a full stop is necessary. The Blue Line's (and NYC's) signals enforce a stop if the signal is violated. There is currently no way of doing that on the Green Line. If such a system were implemented, it would allow for speed controlled timing signals without automation and without the irritating safety stops both which hinder the schedule. In my opinion, this is the way to go. Try to get the anti-human 'we need more jobs as long as we don't have to pay for them' regime to agree, though. Sitting at lights for 18 seconds is a touch in excess of comparable (by a touch I mean extremely). The trains don't sit at each signal for 18 seconds. If you want a true comparison, blow all the stop signs on your way home sometime and see how much faster you get there. You can deduct the amount of time spent waiting for your citations to be issued. ExCon90 wrote: Signals timed to control speed are common all over the New York City Subway and PATH, and as TrainManTy commented it is perfectly possible to arrange them so that a train proceeding under control at the prescribed speed will see the signal clear up as it approaches, so that no stop is necessary. Apart from the other considerations mentioned, standing passengers, of whom there are many on the Green Line at all hours, find incessant stops and starts to be very irritating. These always-stop signals are a big peeve of mine. 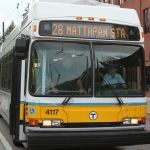 If the T cared at all about getting people to their destination with speed and comfort, they'd get rid of them right away. They're a major reason why the Central Subway often has stop-and-go traffic from end to end, even outside rush hour. People driving on the Mass Pike don't have to deal with the delays and discomfort caused by stop signs. So why should transit riders? It's a generally accepted road engineering principle that stop signs should not be used for speed control. In fact, the MUTCD expressly prohibits it. And most normal passenger rail systems are designed to keep the trains moving, especially in areas that are a capacity bottleneck (and if the Central Subway isn't one of those, I don't know what is). I'm also not convinced that all-stop signals increase safety. They encourage drivers to speed between signals. And if drivers are blowing through red lights at grade and station timers, that's a bigger problem which won't be fixed by a stop signal band-aid. There's also the issue of wasted electricity. Can you imagine how much the meter spins every time a Green Line train accelerates up to speed? Multiply that by the number of daily trips on the Green Line, *and* by the number of all-stop signals in the tunnel, and that's a whole lot of money and energy blowing up the stack.